Published at the tail end of the Golden Age, 1982's The Lost Caverns of Tsojcanth was one of my favorite modules for a long time. Even today, looking back on it, I retain a great deal of fondness for module S4, in part because I played it so often. That's something that's been missing from D&D modules for some time: replayability. Back in the day, I clearly recall using many, perhaps most, modules multiple times and not just with different groups of players or even characters. Rather, the same characters would re-visit modules in which they'd previously adventured, a phenomenon I don't recall happening during the 2e or 3e eras, when modules seemed much more "disposable" in nature. The Lost Caverns of Tsojcanth was anything but disposable. Firstly, unlike a lot of modules, this one included an extensive wilderness component, with the characters having to travel overland to reach the dungeon itself. Now, wilderness adventuring was commonplace in those days, but comparatively few AD&D modules dealt with it explicitly, focusing instead on the dungeon itself. That's probably due to the fact that a great many of these modules had their origins in tournament play, where wilderness adventuring would eat up too much time to include. Ironically, The Lost Caverns is based on a similarly-named tournament module played at WinterCon V in 1976, which did not include a wilderness component. The meat of the module itself consisted of two levels of caverns, formerly the abode of the archmage Iggwilv, binder of demons and mother of the demigod Iuz of the Greyhawk setting. Consequently, the caverns are home to all manner of strange beasts, many of them former servants (or slaves) of Iggwilv, now free to pursue their own agendas. This gives the caverns a strange, almost otherworldly flavor to it, a feeling that lingers more than two decades later. Despite this, Gygaxian naturalism is in somewhat attenuated force, with the various inhabitants of the place doing more than just hanging around awaiting the arrival of the PCs. Even so, most of the naturalism is suggestive rather than explicit, depending on the referee to expand upon the brief details given in the text. That's part of the fun of this module -- figuring out why, for example, a hill giant keeps a giant rhinoceros beetle as a pet or what the dao disguising themselves as harem girls are up to. 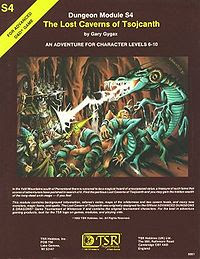 I suppose the real draw of The Lost Caverns was its 32-page monsters and magic items supplement. Remember that this module was published in 1982, before both the Monster Manual II and Unearthed Arcana ushered in "AD&D 1.5e." Unless you were a regular reader of Dragon -- as many of my players weren't -- you weren't familiar any of the new creatures, magic items, or spells previewed there before their appearance in module S4. I'll admit that I loved most of the new material introduced here, particularly the expanded menagerie of demons and demon lords, as they were frequent antagonists in my old campaigns. I also appreciated the new magic items, particularly the Prison of Zagig, which saw much use in the hands of one of the PCs back then. For all my affection for the module, it's a tinged a bit with disappointment and not a little sadness. Like many late Gygax works, you can see a definite change in both the presentation and content. There's boxed text aplenty in The Lost Caverns and, although it's mostly innocuous (compared to, say, Isle of the Ape anyway), it nevertheless presages a shift toward a hand-holding, pre-packaged style that eventually turned me off buying TSR adventure modules at all. Likewise, while I don't generally mind "more stuff," S4 feels a bit like an extended advertisement for upcoming products, notably Monster Manual II. The original tournament module included, so far as I can recall, no new monsters and was perfectly adequate for its purpose. But then that's the point. By 1982, TSR was changing and the purpose of adventure modules along with it, as we'd see more fully in the watershed year of 1983. That's why, much as I like The Lost Caverns of Tsojcanth, I also see it as a harbinger of much I would not like and whose effects proved far-reaching. S4 is also one of my favorites. I can remember Freshman year in High School, sitting in class and reading this book. That picture of Drenzula, Iggwilv's daughter, caught my attention right away. And you are completely correct. The older "Golden Age" modules can be gone back to again and again, unlike some of the more modern ones. I ran this one quite a bit back in the day and I am going to be running it again soon. Replayed this one again and again. Loved it. Seriously nostalgic about this one. I have specific memories of various encounters from 25+ years ago. For me it is either 1 or 1a to "Dwellers of the Forbidden City". That cover is one of my favorite Erol Otus images. I used it on a t-shirt I made for myself. It's got that Weird Tales phantasmagoric melee quality that feels like D&D to me! This was the module where I first encountered the idea of monsters with character levels (or at least presented in ways not covered in the Monster Manual). For example, I think the vampiress had levels of fighter, where the the MM suggested that she could only be a magic-user. I think there was also a mountain giant with levels of magic-user and a gnome whose 18/** percentile strength exceeded the PH maximum. It makes perfect sense now, but to my 12 or 13 year old brain, it was too much. I was obsessed with using only official material, so when something official (that is, from TSR) seemed to contradict other such, it was both exciting and confounding. I was constantly wishing that with clouds would open and Gygax would descend with the One True Ruleset. One of my favorites. I remember buying S4 at a con in Omaha back in (83 or 84 where I grew up. I read it from cover to cover several times. Hope to run it sometime soon. "That cover is one of my favorite Erol Otus images." This is what I was going to say. I like all the copious artwork in S4, but the cover practically fills me with lust to play that adventure. I adored this module. It was one of the few that my gaming group owned and one of the great appeals was all the new supplemental material included within. There's a special place in my heart for this module. While its 3.5e era, it adds more information that could be easily be converted to whatever version you choose to play. The original tourney version was released in 1976, well-before the MM, but even so doesn't seem to have featured any new MM-only monsters. You can compare and contrast the two versions of the module on my site @ http://www.greyhawkonline.com/grodog/gh_s4_encounters.html, and read up on more of the module's history @ http://www.greyhawkonline.com/grodog/gh_s4.html. Sometime I'll get around to adding the S1-4 Realms of Horror supermodule changes to the encounters comparison page too. There are actually three "new" monsters that were first published in "Lost Caverns of Tsojconth" before showing up in the MM: water weird, troglodytes, and neo-otyugh.